Mount Umunhum is one of the highest peaks in the Bay Area. This mountain top had been something of a sore spot in the mountain biking landscape of the South Bay for quite a while because, despite being part of the Midpeninsula Open Space (MROSD) parklands, it had been closed to the public until recently. The MROSD wasn't exactly quick in making this peak accessible to the public, at least partially due to the scale of the clean-up effort necessary to get rid of the dangerous stuff left from the Almaden Air Force Station that used to occupy this peak. I've heard some locals measure the saga of public access to Mt. Umunhum in decades, but I think they must be counting it all the way from the closing of the Air Force base in 1980. In practice, it doesn't look like much real work was done on this before the approval of some funding in 2014. In any case, what I've been used to thinking of as "that peak that we still can't ride to" over many years of biking has just been fully opened to the public at the time I write this. In fact, I'm posting this page on the first weekend that the peak is open, in September 2017. Part of the reason I rushed to represent this ride here is my excitement about a bonus that came with the opening of the peak: Mt. 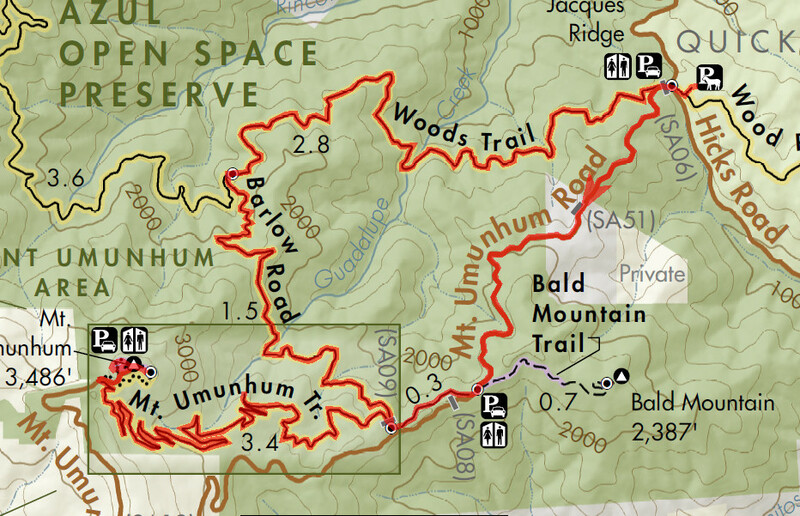 Umunhum Trail, a brand-new, 3.5-mile singletrack. This new trail was built as part of the effort to open the peak to public access and it takes you from Mt. Umunhum Road (near its junction with Barlow Road) all the way to the peak. This is a great addition to the Sierra Azul Open Space whose total bike-legal singletrack mileage before this was exactly zero. I have to clarify that Mt. Umunhum Trail is built as a "multi-use trail" with a width no less than three feet in most places, and often more like four. So, it's not exactly the type of singletrack that mountain bikers usually get excited about. But, it's fun nonetheless, and there are some spots on it where it feels closer to a narrow singletrack. Given time (and enough exemption from maintenance), I would expect this trail to settle down and age into a fairly decent mountain biking trail. The route you see on this page is my preferred way of getting to the peak of Mt. Umunhum by bike. It has to be stated, though, that this is not the only way of doing so. Riders who can't stomach the mileage or the climb of this ride can park in the Bald Mountain parking lot and ride only Mt. 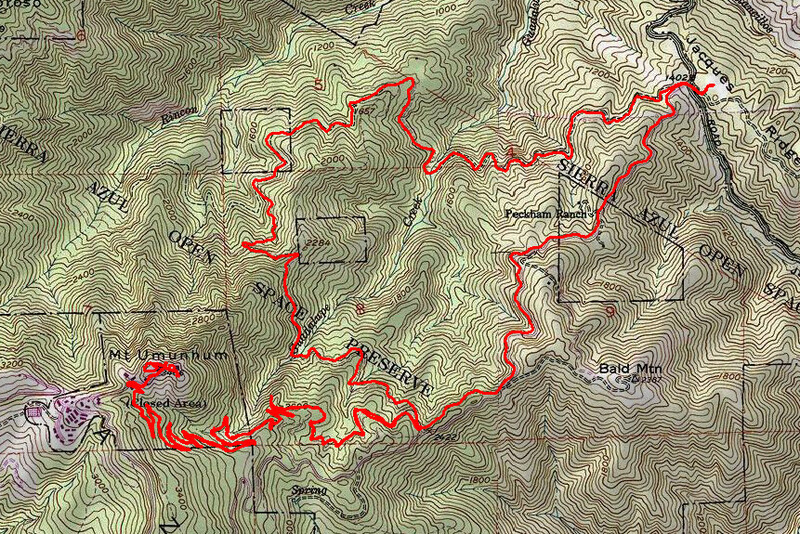 Umunhum Trail to get to the peak and back, doing a 7-mile ride with roughly 1300 feet of total elevation gain. In fact, if all that you're interested in is seeing the peak, you don't even need to use any trails. You can drive your car or ride your road bike via Mt. Umunhum Road straight to the peak. The route you see on this page is my solution for getting to the peak by mountain bike and ending up with a ride of satisfactory mileage. The ride begins from Hicks Road. You'll see that the Suggested Parking link on this page points to a free parking lot of the Almaden Quicksilver County Park. I would actually consider this the backup parking option for this ride. Your first choice should be the parking lot of Sierra Azul Open Space (also free) right at the intersection of Hicks Road and Mt. Umunhum Road. However, that parking lot is a small one with room for only 13 cars by my count, and it doesn't feature any overflow capacity along the roadside. So, it shouldn't come as a surprise if you find that it's full, in which case you should try where I parked. You need to be aware of one quirk of this Almaden Quicksilver Park lot however: the parking spaces along at least two of the outer edges of the parking lot are reserved for trailers, with posted signs clearly stating "no car parking". Cars are allowed primarily on either side of the island in the middle of the lot, and possibly along the other two of the four outer edges. I've heard from a park ranger that they show some tolerance on this, but the risk is yours. You've been warned. This ride takes the paved Mt. Umunhum Road up to Mt. Umunhum Trail on the way up and follows fire roads on the way down, thus traversing the loop portion of the route clockwise. I would strongly recommend this direction to anyone who tries this ride, because doing it the other way will throw you up against some torturous climbs on Barlow Road. More on that below. The fact that Mt. Umunhum Road is an easier climb than parts of Barlow Road doesn't make it an easy climb, however. The steepest part of Mt. Umunhum Road that's included on this route is at its beginning. Your first half mile on this road is its worst part, where the grade shoots up to more than 15% and only slowly begins to moderate back from there. After about the 0.8-mile mark of this route, the grade of the road finally dips below 10% consistently, and you might think the worst of the climb is behind you. That's almost true, but only after the road takes you all the way up to 15% one more time around the 1-mile mark of the ride, and by that point, you've effectively reached the trailhead of Mt. Umunhum Trail anyway. On the positive side, Mt. Umunhum Road is reasonably spacious and features lane lines along its middle as well as its sides. Its surface is a grippy looking but smooth asphalt that seems to have been refreshed as part of the effort to open the peak of the mountain to public access. The shoulder space is rarely more than a foot in width (if that), but there are numerous spots where it's more generous. At the time of my ride, the amount of traffic on Mt. Umunhum Road was around or just under what I would consider "moderate", but I'm certain that this was because my ride was effectively on the "opening weekend" of the mountain's peak. Under less exceptional conditions, I would expect the weekend traffic level on this road to be no heavier than what you would see on Mt. Hamilton Road, which is much more on the lighter side. You reach the beginning of the new Mt. Umunhum Trail at essentially the same point where you reach the Bald Mountain parking lot of the Sierra Azul Open Space. This trail gets down to business by beginning to climb right away and doesn't really let up until you reach the peak. The typical climbing slope of the trail averages something like 7.5%, but the grade is not very even. Not only are there rollers on many stretches of the trail that could serve to make the descent more fun, but different segments feature slightly different average steepness as well. You will find stretches where the slope ranges between 10 and 12 percent, and also some breezy segments where it's more like 5%. One possibly surprising aspect of Mt. Umunhum Trail is that it's not very scenic. The trail stays under tree cover for a considerable portion of its length and the rest of it is fairly closed in by high brush on both sides. You still get to catch some South Bay views from several spots, and most notably from the Guadalupe Creek Overlook, but you'll have to wait until you get to the peak to take in the really big views. Still, this is a lovely trail that was obviously designed with care. It features playful twists and (as I already mentioned) fun rollers, which make the descent quite enjoyable. It's smooth and non-technical at the time I write this, though many of its plentiful hairpin turns are tight and tricky. There was also some amount of loose trail surfaces, most noticeable while negotiating the switchbacks in the descending direction, but I'm not sure if this is because the trail is too new and unsettled or if it will be a seasonal reality in the late summer and fall. Mt. Umunhum Trail ends by connecting back to Mt. Umunhum Road less than a quarter mile from the peak. This last short and steep stretch on pavement finally leads you to the point of the ride with all the things to look at and the photo ops. It would be stating the obvious to say that the views from the peak are expansive and reach far. This is a ride for which you want to be careful about the weather forecast, in order to make sure that you pick a day as free from clouds and haze as possible. The places you can see from the peak range from Mount Tam and San Francisco (not to mention some other peaks farther away) in the north to Gilroy in the south. The views facing southeast are interrupted a little bit by the nearby Loma Prieta peak. Views of Santa Cruz and the Monterey Bay are also available, but the main visitor area at the peak is not directly open to those. You need to ride nearly half a mile down to the last intersection before the peak on Mt. Umunhum Road to catch the views facing south toward Santa Cruz. If you actually followed Mt. Umunhum Road all the way to the peak, these views of Santa Cruz would also have been available to you over a one-mile stretch just before reaching the peak. The peak area also features a wealth of information panels about the geography, history, and significance of the area, and, of course, there's always "The Cube" to gawk at. After enjoying the 3.5-mile return portion of your out-and-back on Mt. Umunhum Trail, you'll be turning onto Barlow Road to continue your descent. Going back down, you won't be setting foot on public roads again until you reach Hicks Road. Barlow Road is a wide and relatively smooth fire road. It's also open to more views than Mt. Umunhum Trail, though these could be considered relatively inferior in comparison with what you already saw from the peak. The bad news about Barlow Road is that it has one last bad climb in store for you. You can see this climb on the elevation profile on this page, sticking out like an annoying thorn in the descent portion of the plot. The average slope of this 0.3-mile climb out of the Guadalupe Creek valley is "only" around 11.5%, but it's second half is steeper. So, be prepared to muscle up grades ranging between 14 and 17 percent for nearly a quarter mile. When that last bad climb is behind you, Barlow Road immediately dives into a steep descent. This descent lasts for a little over half a mile and averages a grade of -15.5%. Of course, the average grade doesn't tell the whole story. In three stretches, the grade reaches or exceeds -20%. This steep descent also has some of the loosest and ruttiest parts of Barlow Road. The ruts weren't very deep at the time of my ride, but the loose surfaces made some of the descent sketchy. This is not a part of the ride that can be recommended to beginners. On the flip side, experienced riders may find this part of the ride as some of the most fun on this whole route. That wild descent feels like it's suddenly cut with a knife when you turn onto a portion of Woods Trail that is perfectly level for a quarter mile. These shady stretches of Woods Trail then slowly begin to descend, initially quite gently (at about -3% typical grade) and then ramp it up a couple of notches and head down more steeply (close to -10% grade) especially as it begins to descend back into the Guadalupe Creek valley. Near the end of the ride, Woods Trail makes you work a little bit more as it climbs away from Guadalupe Creek, where it gains 200 cumulative feet of elevation in half a mile. The trail follows an oddly repeating pattern as it does this. While going through a series of zig-zagging curves, it does a short but relatively steep climb at each right-hand curve and continues flatly (or even descends slightly) on each left-hand turn. This pattern is repeated four times by my count. This odd pattern is something that I also remember observing on the nearby Limekiln Trail. The route features changing levels of tree cover. The tough climb up the paved Mt. Umunhum Road and the time you spend at the peak will be completely exposed to the open sky. Mt. Umumhum Trail is mostly shady, with only a handful of open spots, though some of the shade is not very deep shade. Barlow Road has changing tree cover. Once you reach Woods Trail, however, you'll be mostly in the shade until the end of the ride with the exception of only a few spots. I've already mentioned a shorter option to bike to the peak. For riders who are looking for more miles instead, there are ways you could extend a ride that visits the peak of Mt. Umunhum. Woods Trail allows you to connect to the peak from Kennedy Road or Limekiln Trail. If you're not willing to loop back via roads, however, that would leave you with a truly tough ride, because Woods Trail is the only trail connecting the western and eastern halves of Sierra Azul Open Space, so you'll need to go back the way you came for the most part, while also incurring that very steep climb on Barlow Road along the way, not to mention the return climb on Woods Trail. Another option is to include some mileage in Almaden Quicksilver Park on your ride. You can start from the Hacienda or Mockingbird Hill entrance of that park and connect to this ride via Wood Road Trail, although, once again, you'll need to climb back up Wood Hill Trail on your return unless you're okay with returning via Hicks Road and Alamitos Road in traffic.